Clarets midfielder Jack Cork says plenty has changed since he scored his first ever goal in the Premier League - a header against Spurs at Turf Moor in 2010. The 29-year-old was brought in on loan from Chelsea by former Burnley boss Brian Laws and made 11 appearances for the club as they were relegated back to the Championship. Gareth Bale and Luka Modric had given Spurs, who fielded Aaron Lennon and Peter Crouch, a 2-0 lead but the Clarets battled back to win 4-2 on the final day of the season. Wade Elliott started the comeback just three minutes before the break before Cork levelled things up in the 54th minute, converting Martin Paterson’s delivery. Paterson scored Burnley’s third from Steven Fletcher’s cross and then Steven Thompson got the slightest of touches to Elliott’s strike in the 88th minute. “We beat Spurs 4-2,” he said. “It seems like a long time ago. It was a good moment for me, a special moment. The Clarets were just seconds away from securing a second successive point against Spurs at Wembley in December until Danish playmaker Christian Eriksen intervened. Mauricio Pochettino’s side have won five of their last six games in the top flight, and added an impressive 3-0 victory over Borussia Dortmund in the Champions League, but Cork isn’t intimidated. 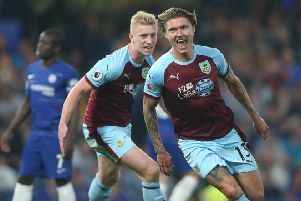 Burnley secured a record seventh game unbeaten in the Premier League when beating Brighton 3-1 at the Amex Stadium and the midfielder is hopeful of adding to that. “It’s Spurs, another top six side, but we’ve been in great form, we’re seven unbeaten now so we shouldn’t be scared of anyone, especially at home,” Cork said. “We’ll go in to it with a good attitude and I’m sure we’ll be able to get something. We’re in a good place and we know we’re going to go out there and put a good performance in. When we’re all performing well and we’ve got the right attitude then we do get results.